It’s like October 1980 all over again! Silver trucks, beacon and all. 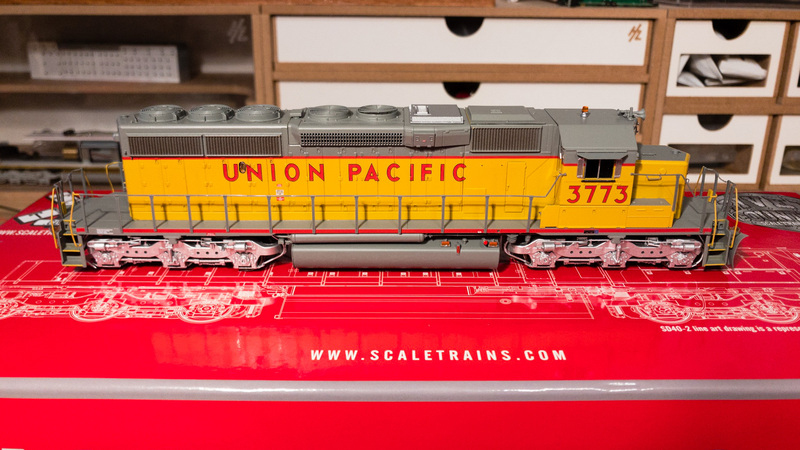 A brief glance showed a pretty nice model albeit one clearly designed for the RTR market. The shell is well rendered and the proportions are correct. 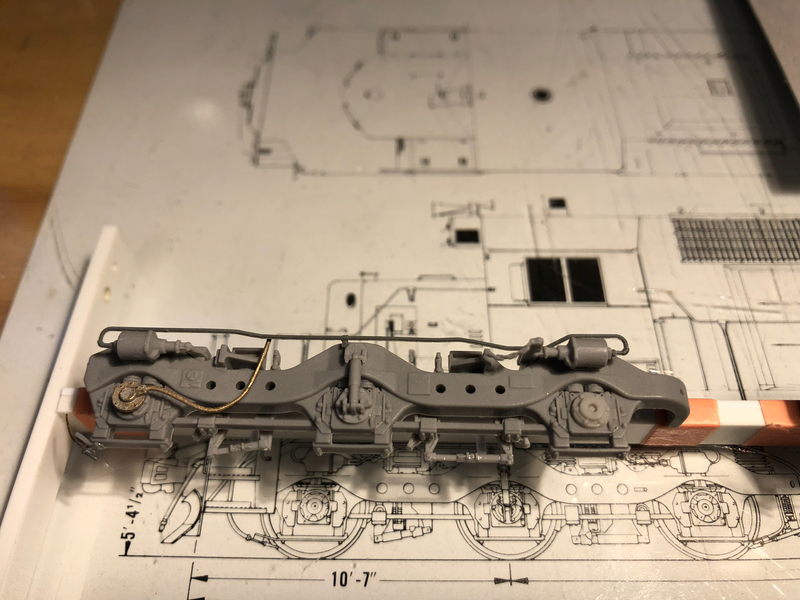 However some of the engineering is questionable, the parts were not properly cleaned up after being removed from the sprues and many of the details were installed poorly. These aren’t deal-breakers, but they are frustrating. Overall, the level of detail is impressive. It’s just really unfortunate that everything has to come preinstalled as opposed to on a sprue or in bags. I don’t think the blame for this lies with Scale Trains though. 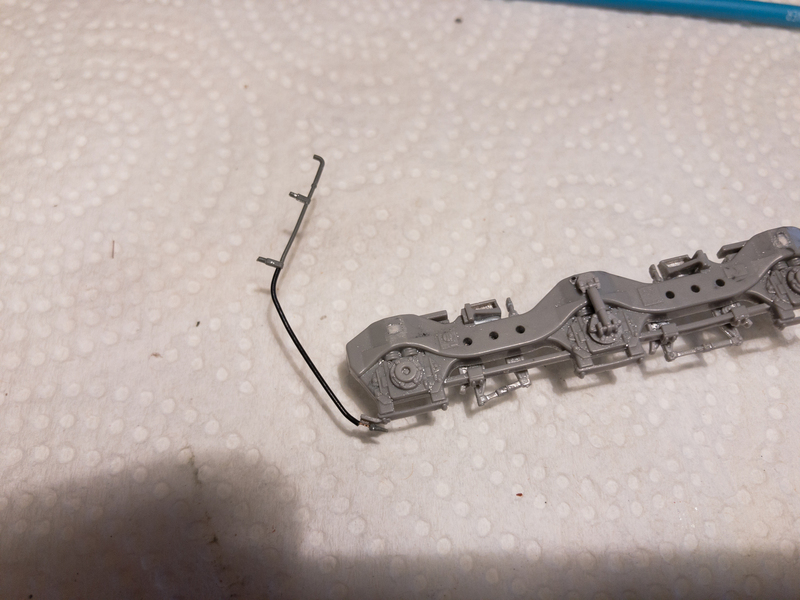 I’d point to the laziness of the RTR crowd that gets bent out of shape when they have to press fit a part into a pre-drilled hole. Even worse than the fact that the parts are preinstalled is the fact that they’re almost all copiously glued into place. Because god forbid anything fall off in shipping. The fit of the major components was a little wonky as well. 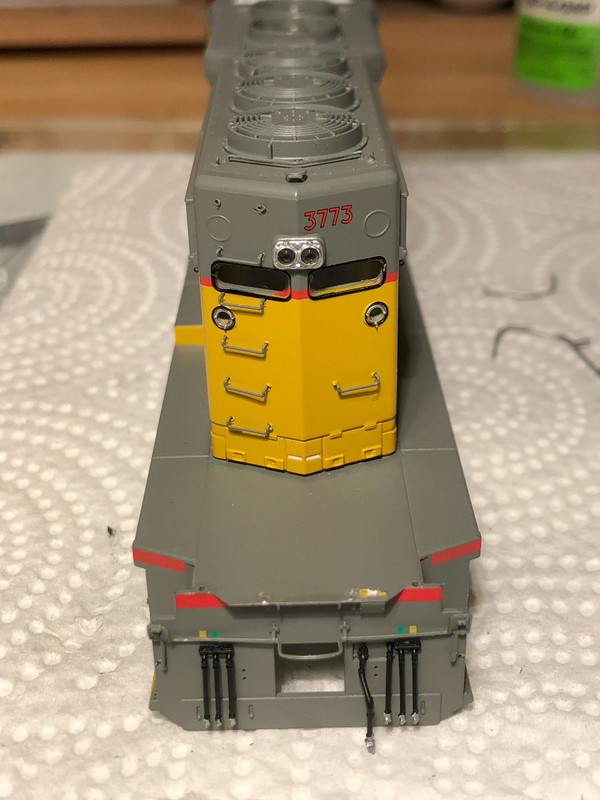 Something about the frame rail detail part causes it to look like it bows up. Extensive cleanup of flash and excess paint on both the plastic and metal frame components didn’t make it look much better. The fuel tank also needed some work to get it to seat into the frame weight properly, some of the steps were crooked and the shell itself has an overly tight fit on the frame. I should point out here that for the most part I was able to fix these issues with a minimal amount of work and basic tools and skills but I’d rather I hadn’t needed to. On the positive side of things, the paint is excellent. It does in fact match Tru-Color Armor Yellow and Harbor Mist Gray. The lettering is crisp and accurate. Best of all the paint strips easily with 91% alcohol and the lettering can be removed with the paper-towel-soaked-in-Solvaset trick, without disturbing the underlying paint. 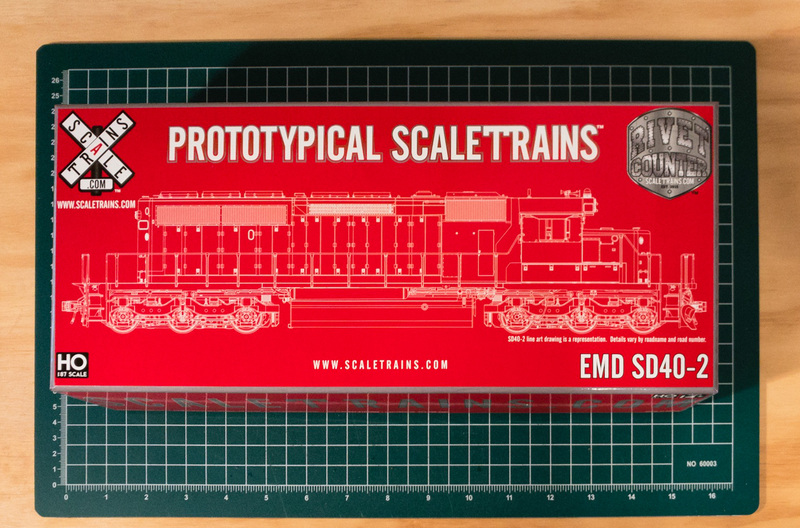 As an early release from a very young company I think Scale Trains did a reasonable job on these. More importantly I’ve found them to be happy to hear from customers and incredibly receptive to feedback . 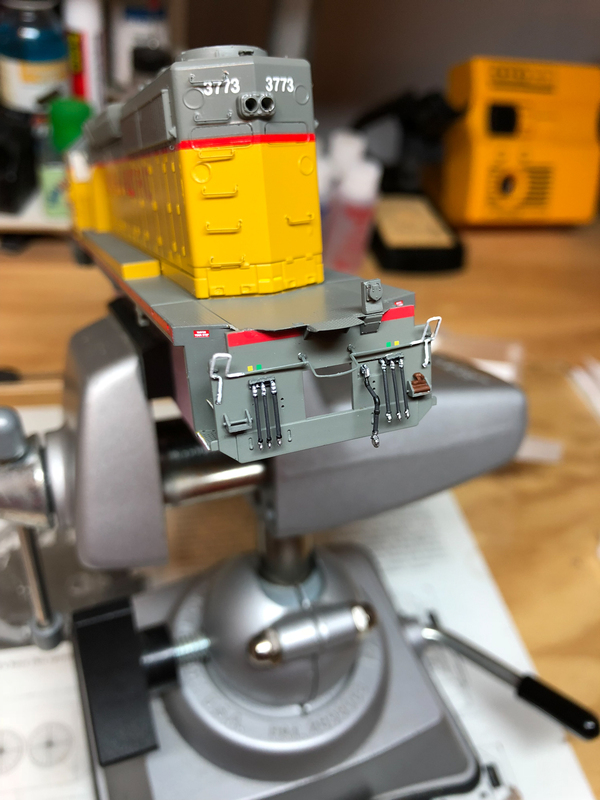 As the two additional SD40-2’s I purchased from the second run have shown, they’re willing to make the necessary changes to improve quality control and fix design issues. 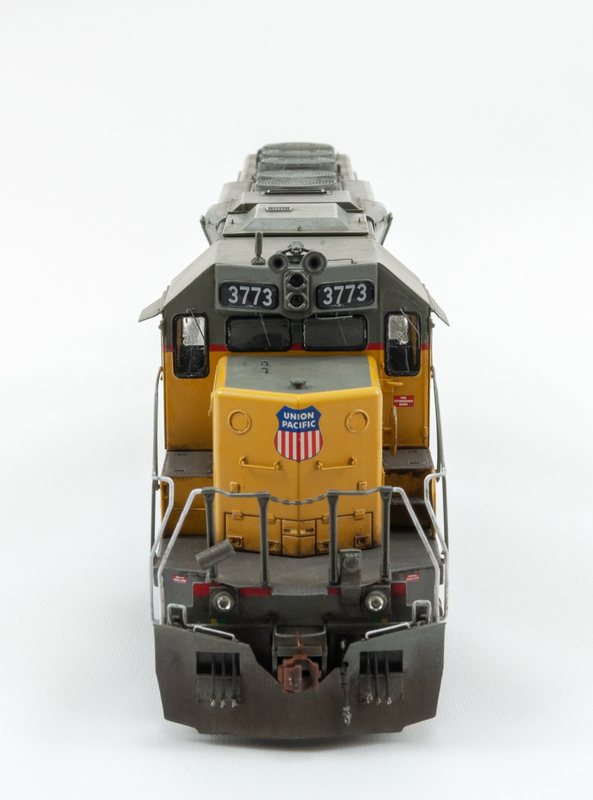 If you want to buy an accurate model of an SD40-2 Scale Trains offering is the only choice worth considering. 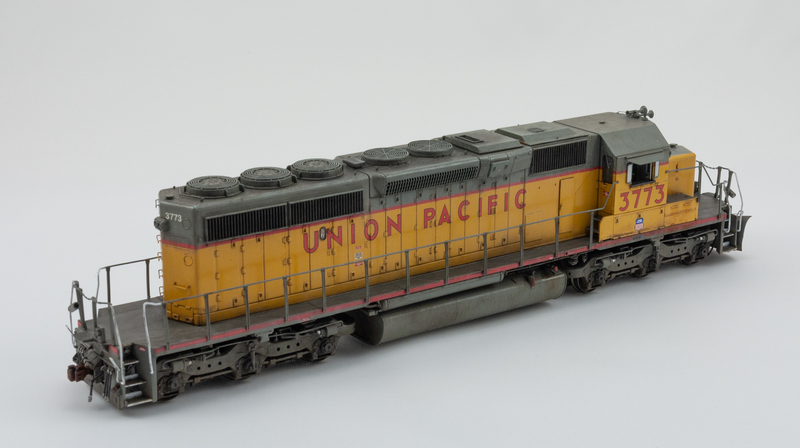 I purchased a model of Union Pacific 3773 which was built in Oct. 1980 as part of EMD order 796345 for 40 units to become UP series 3769-3808. 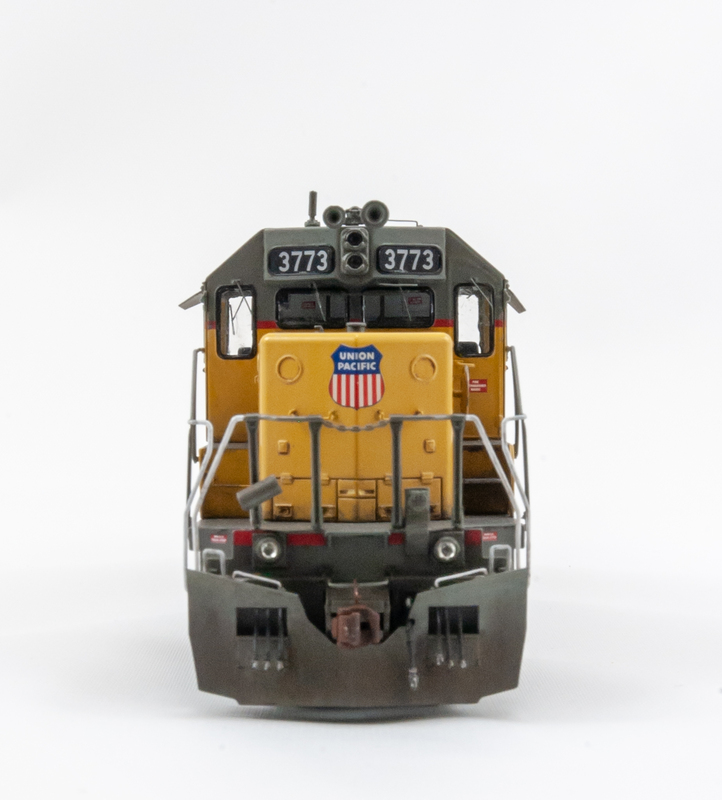 According to Brian Bennett’s meticulously researched spreadsheet of SD40-2 phase variations: http://www.contrailroads.com/sd402phases/ (scroll to the bottom and download the actual database. It’s an amazing piece of research) this is a phase IIIb2 unit. Phase III units were built between Dec. 1979 and Dec. 1981 and saw the introduction of (among many smaller details) exhaust silencers (phase IIIa), Q-fans (phase IIIb1), and a strengthening rib across the middle of the battery box doors (phase IIIb2). 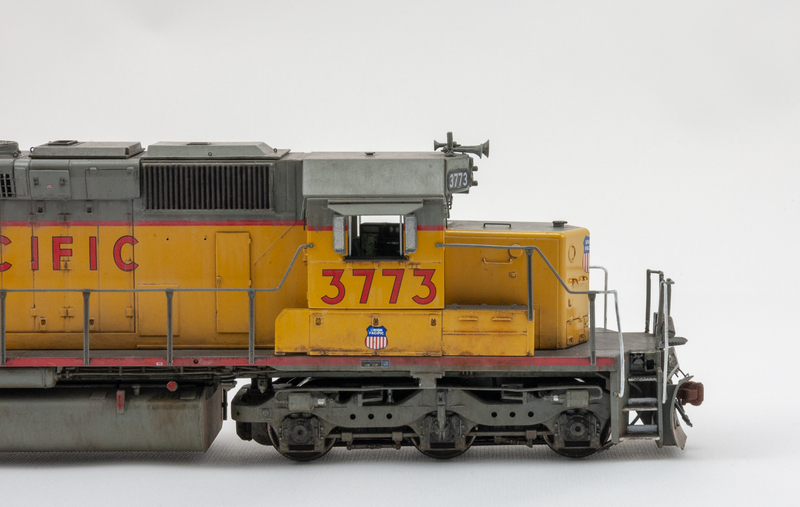 These are in addition to changes that became standard in earlier phases such as corrugated radiator grills (phase 1b1 or 1c1 depending on whether the unit was UP or BN), clean cab/88″ nose (phase IIa1), etc. Specific spotting features of this series include brake wheels instead of brake levers, extended range dynamic brakes (visible as an additional bulge around the exhaust silencer) and, as built, a beacon, class lights and silver trucks. 3773 did eventually get a waste oil reclamation tank cut in to the right rear of the fuel tank (http://www.rrpicturearchives.net/showPicture.aspx?id=3523941). 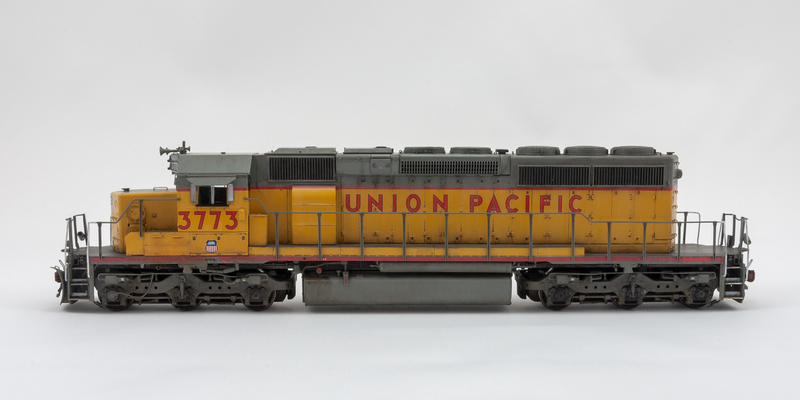 These were generally added during the UP’s SD40-2R Life Extension Program but that ended in 1999 without 3773 having been upgraded (See here for more info: http://utahrails.net/articles/sd40-2r.php). I think it’s most likely that the waste tank was added after the LEP program ended. Since that was after my era I left it off. 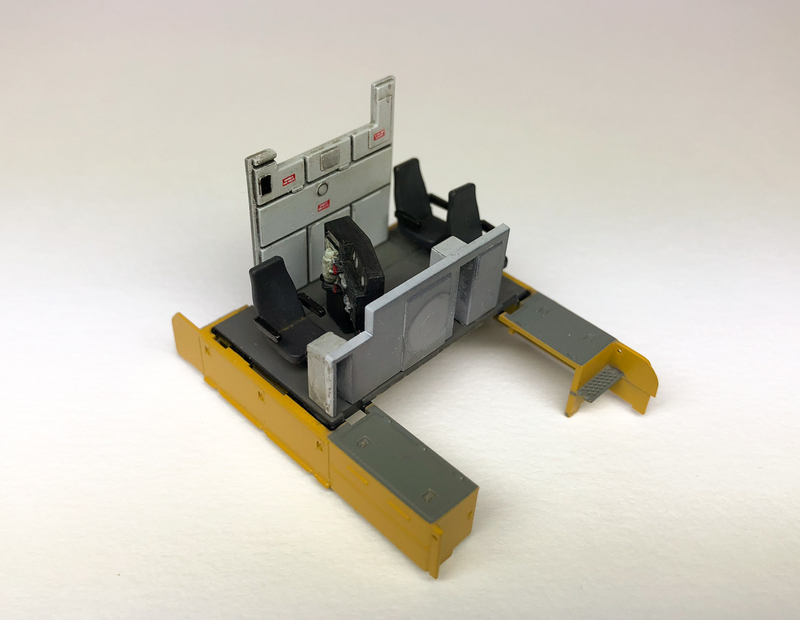 It took awhile but I managed to break the model down into most of its component pieces. After this photo was taken I ended up figuring out how to remove a few other sub-assemblies. I stripped the trucks and cut off the inboard sanding hose brackets as UP had removed these by the early 1990’s. 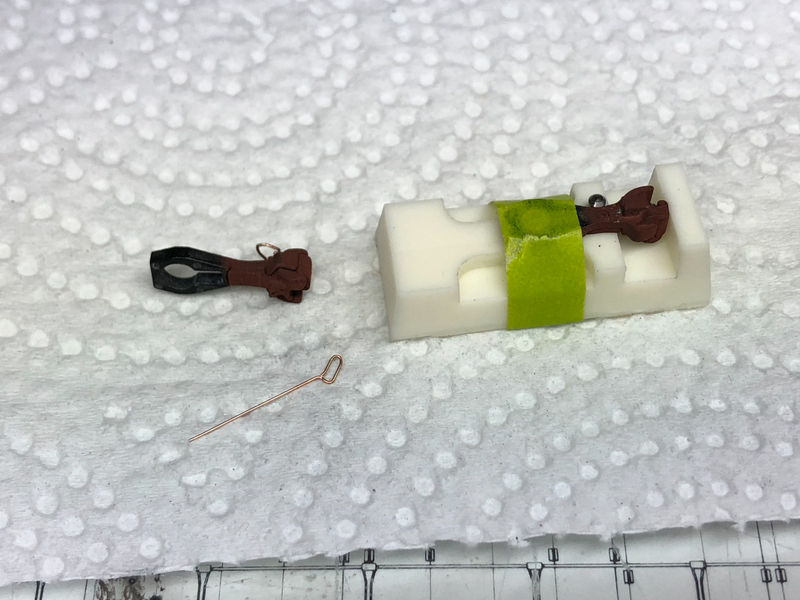 I modified the outboard sanding lines by gluing the nozzle to the bracket and replacing the plastic hose with insulation from a micro bulb. I also removed and reattached most of the brake cylinders as they were crooked. I drilled out the front and rear class lights and removed the rear number boards as they will be painted over. 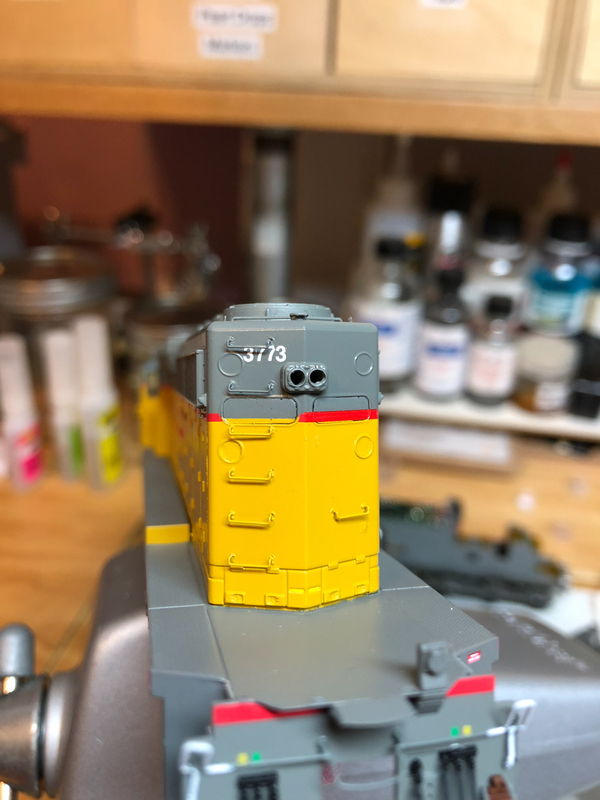 I also removed the red “UP 3773” which will be replaced with just “3773” in white. The deck mounted MU cable receptacles were removed for repainting as well. 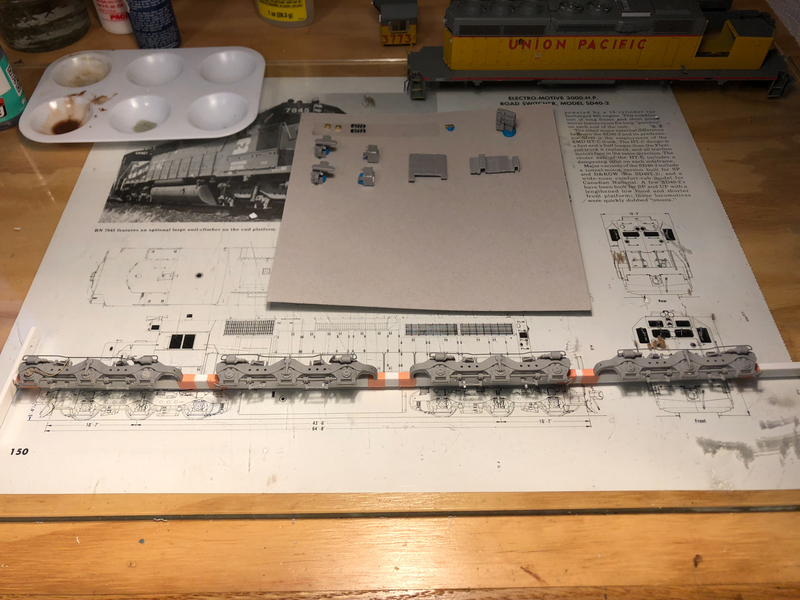 The class light openings were filled with styrene rod to create blanks. The rear grab irons were painted armor yellow where appropriate. The front and rear headlights were painted gray, the number boards were painted, reinstalled and striped. 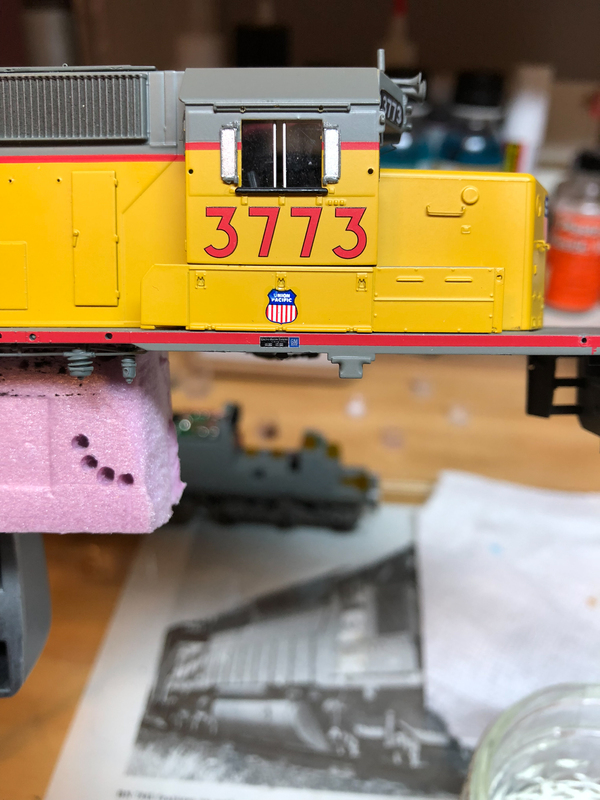 “3773” was added in white on both sides of the long hood end. The spare knuckles were removed from the fuel tank. New brackets were built and these were attached to the rear pilot. Their former locations on the tank were plated over. The MU receptacles were painted gray and reattached. 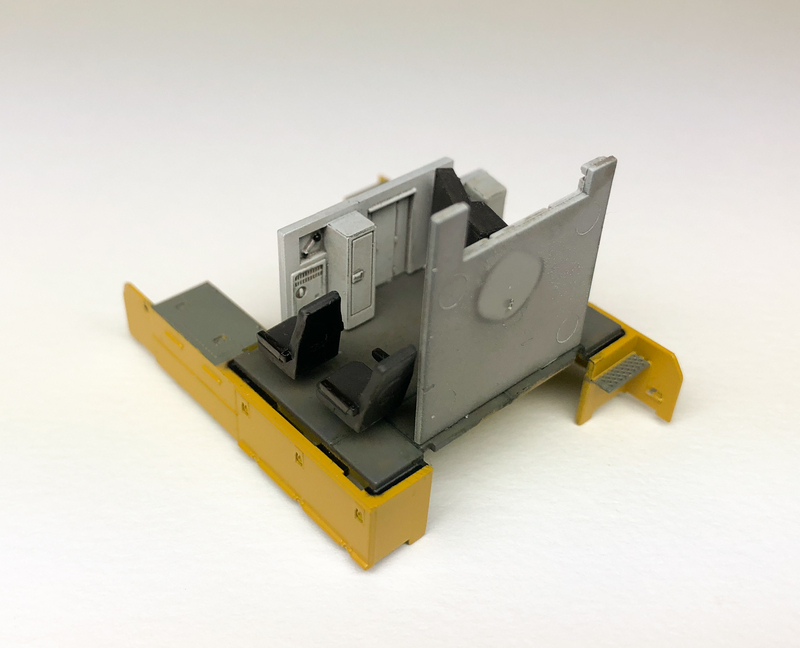 The coupler cut lever ends were repainted white as were the step edges. 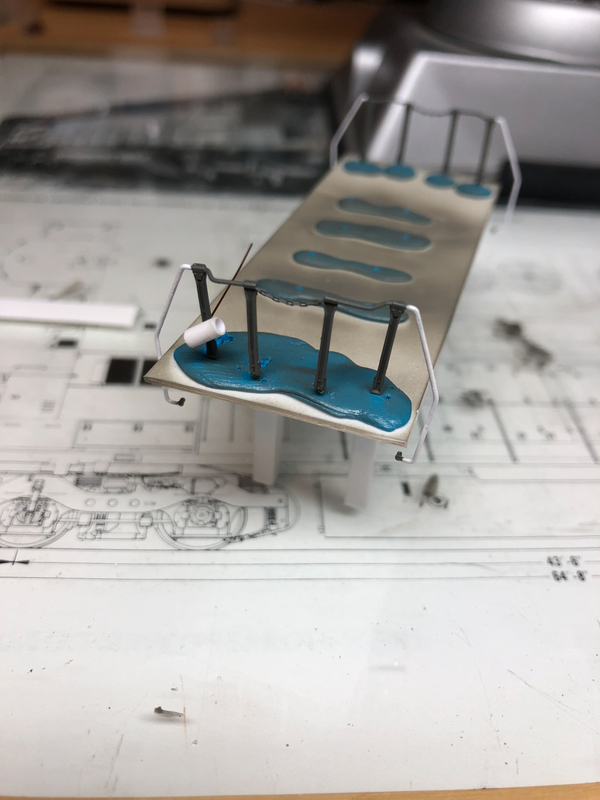 The hand rail ends were painted white and the cans that UP mounted as dummy MU receptacles were fabricated from hollowed out styrene rod. 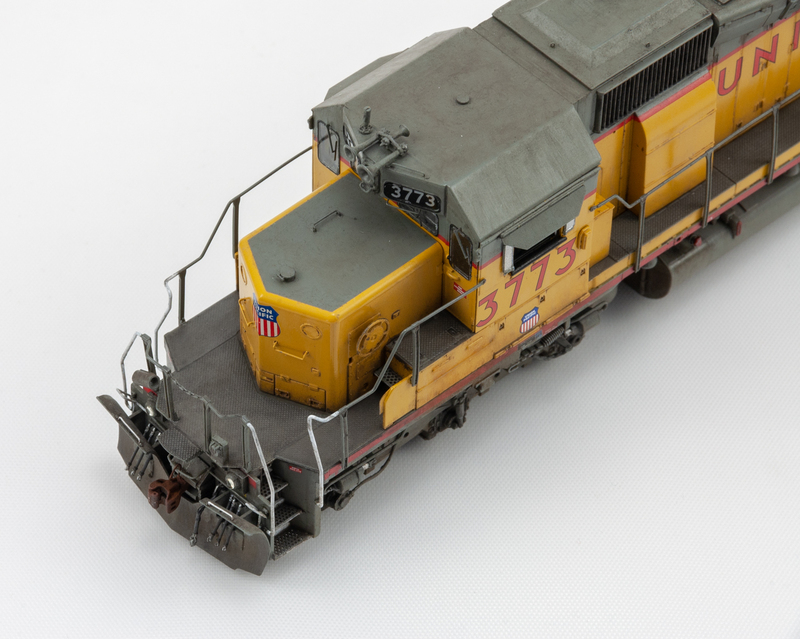 New heralds were added below the road numbers on the cab sides (the Solvaset kind of melted this one :-/.) The edges of the mirrors/wind deflectors were painted gray. Pilot mounted ditch lights were installed. The red striping in the step wells was removed and warning decals were applied. Grab irons were added to the top of the plow and under and over the number boards. The beacon was removed and blanked with a spare C&C cover. Sergent couplers were built and pin lifter rings were fabricated. The Sergent’s are nearly a drop in fit and only need to have their shanks thinned slightly. 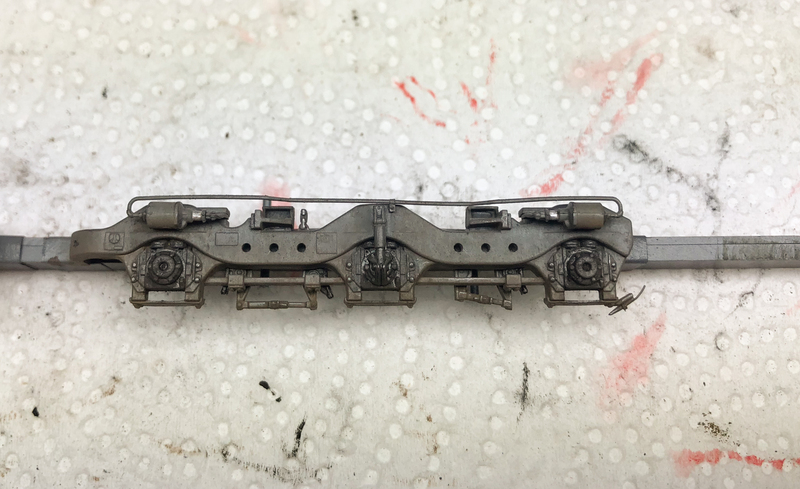 The handrails and couplers were reattached. 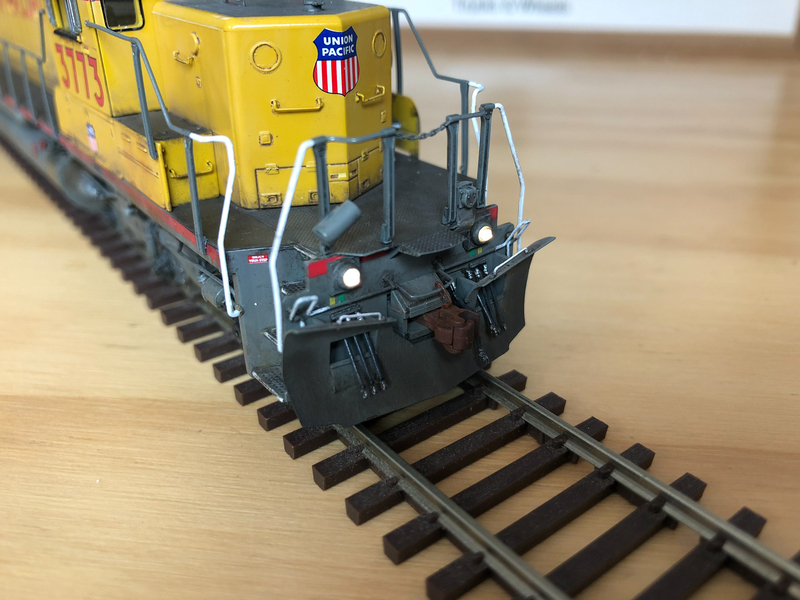 The ditch lights were tested and lenses were added. I don’t have a photo of the LED installation but there’s already a cavity in the frame for them. I just wired up a couple of Ngineering Micro LED’s, glued them to some styrene and stuck them to the frame. The circuit board already has pads for ditch lights so I just wired them there. The shell can be completely removed without needing to disconnect any wiring. 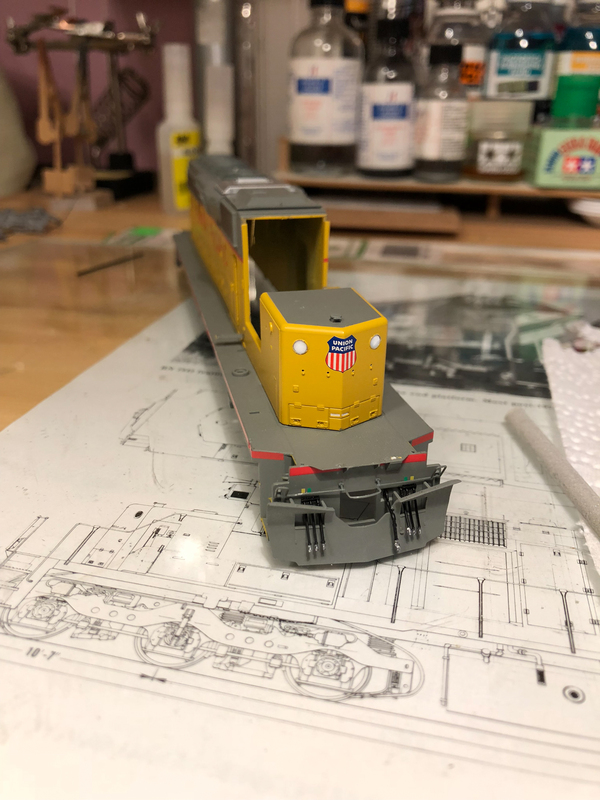 I didn’t strip and repaint the entire model. My goal with this project was to see if I could do a decent job updating it while still saving most of the paint. Where I did strip paint (mostly on the underframe components) I grit-blasted and primed with Mr. Surfacer 1500 Black prior to applying the appropriate TCP color in lots of thin layers. 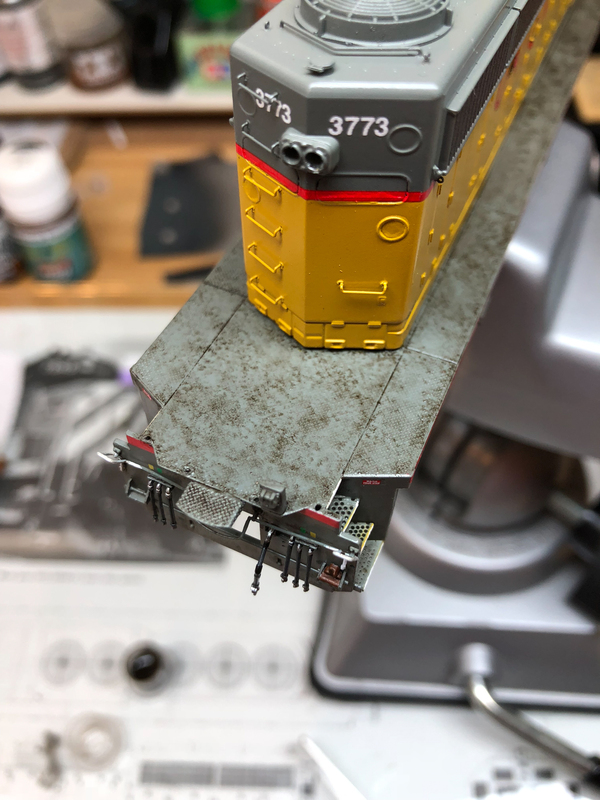 Painting like this made it pretty easy to get a very close match to the factory paint and any variation was covered up by weathering. 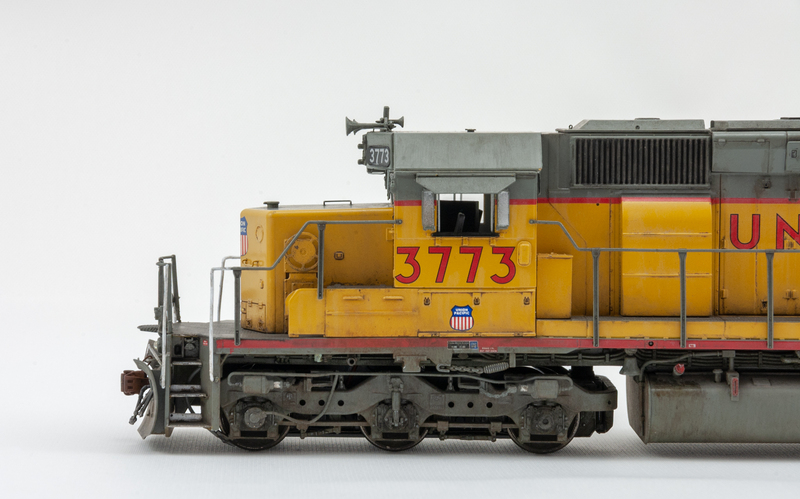 The sideframes, traction motors and cab interior pieces were all completely stripped, grit blasted and repainted. I mounted the sideframes on a jig made out of styrene strip so that I could paint and weather them at once without needing to hold them. The sideframes were primed in black and then hit with a few layers of Tru-Color Harbor Mist Gray. 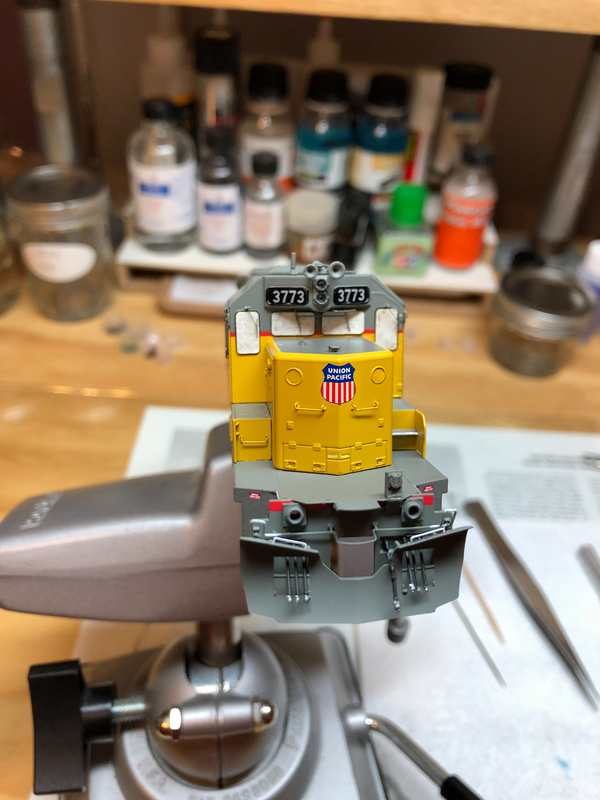 Details were hand painted and various Mig or AK washes and pigments were applied along with a bit of Winsor and Newton oils here and there. I blended the oils a bit and then applied some pigment wet. This adhered the pigment nicely and created some texture in especially dirty areas. 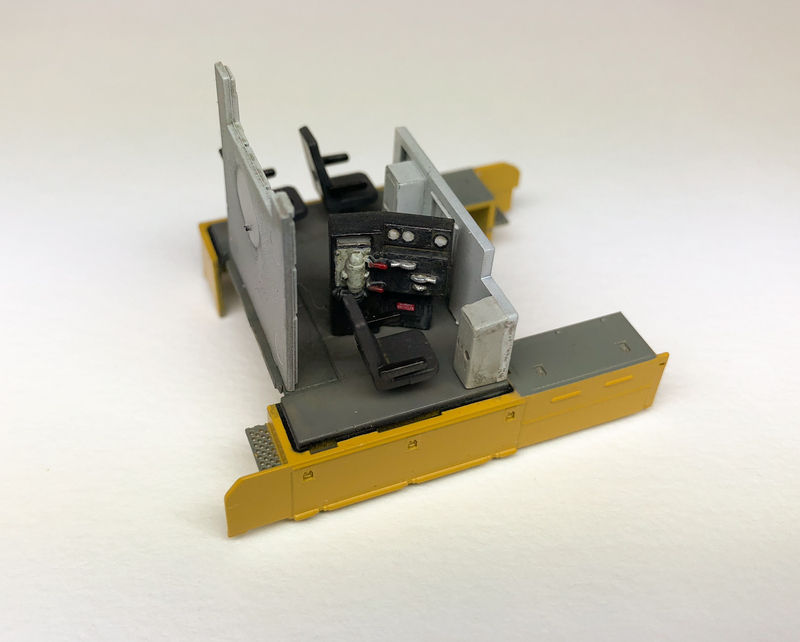 The cab interior was sprayed with base colors and then details were picked out by hand with Mig and Vallejo Acrylics. 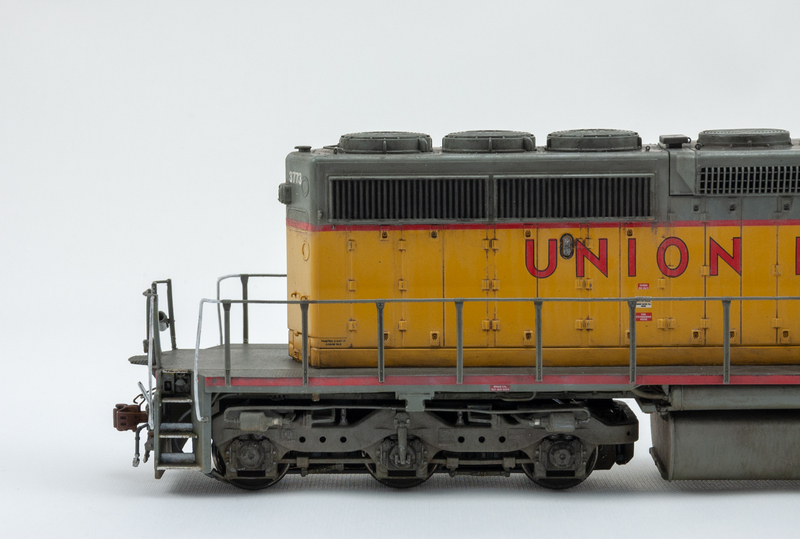 Washes and pigments were applied and carefully worked to give a used but not worn-out look. High voltage warning decals were taken from a Microscale UP decal sheet. 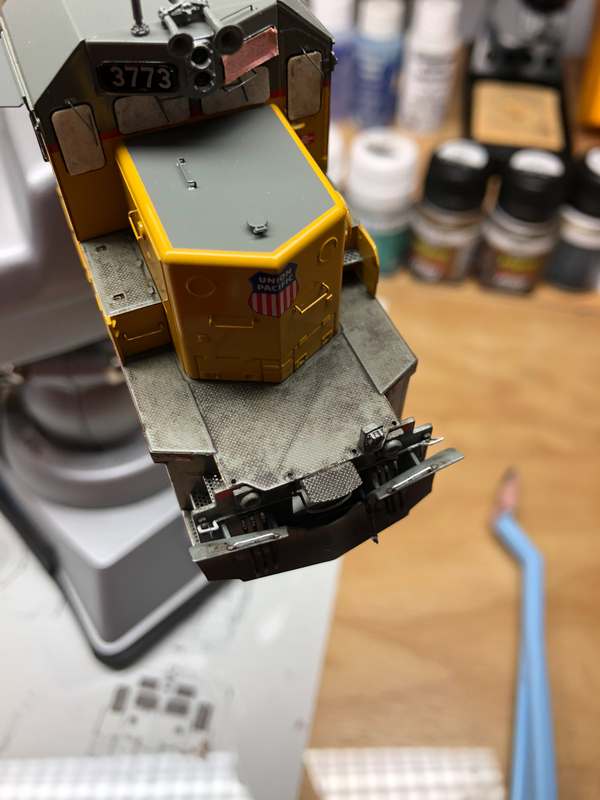 I spent most of my time weathering the deck as this area tended to exhibit the most grime and wear. I started with a few colors of washes that didn’t flow particularly well. Eventually I was able to blend everything in. The magic really happened with I applied Mig Gunmetal pigments. applying just a tiny amount and then burnishing the area with a paintbrush created a very satisfying worn metal look. After the deck was done the rest of the shell was smooth sailing. 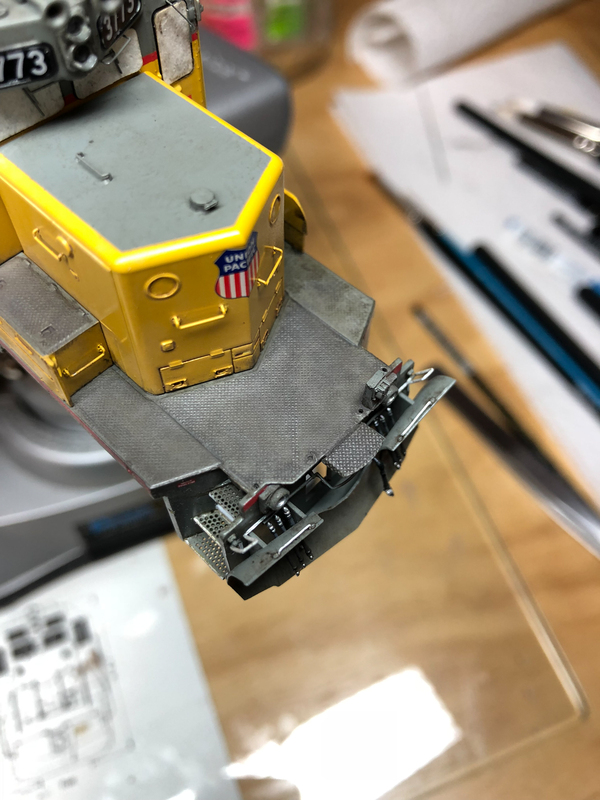 I applied a few different panel line washes, painted the grills and added pigments sparingly overall but heavier in areas that would see a lot of exhaust residue. Overall I’m pretty happy with what I was able to accomplish with this model. There are a few things I’ll probably do different next time like replace the front MU hoses, that don’t hang properly over the plow, with brass ones and the molded chains with real chain. 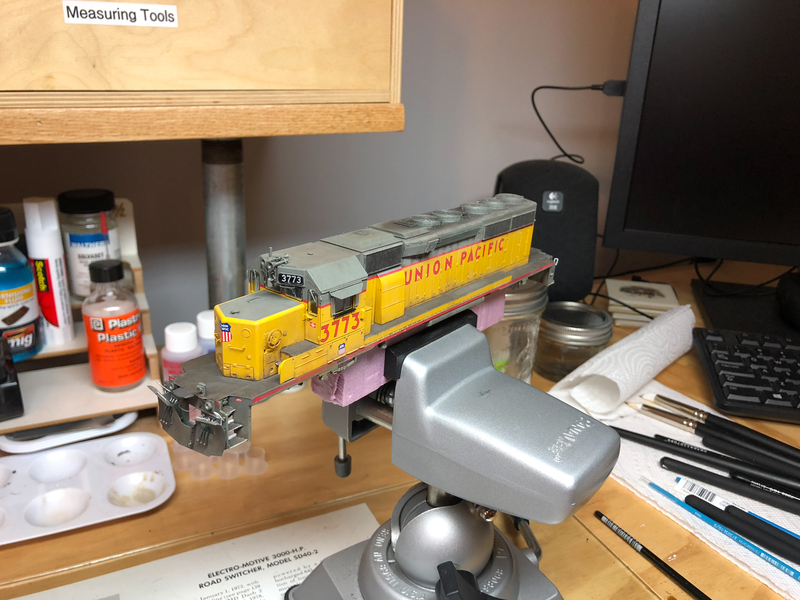 I’ll also probably touch up some of the weathering and add more pigments once I have a layout and I’ll be able to keep handling to a minimum. For now though, I’m calling it done. I recently built a decent studio photography setup that’s a big improvement over what I was using (just my bench lighting) and I think I was able to get some halfway decent shots to showcase this model. Click on the thumbnails for bigger photos and click the photo again for full size. You’ll be able to see all my little screw-ups better than I can see them in person! Enjoy and please let me know what you think. I’m always open to suggestions that I can apply to my next project. 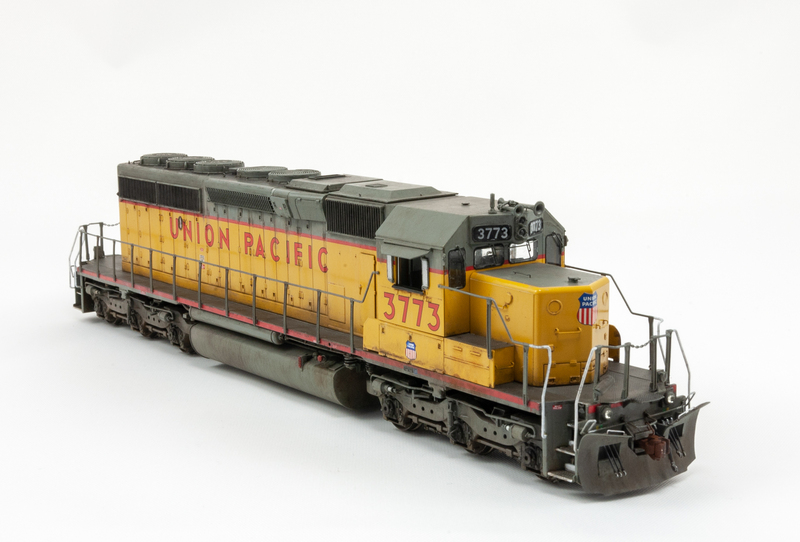 This entry was posted in Locomotives, Model Railroading and tagged Model Railroading, UP by Milepost15. Bookmark the permalink. You did a nice job documenting what you did, and how. Thanks for sharing. 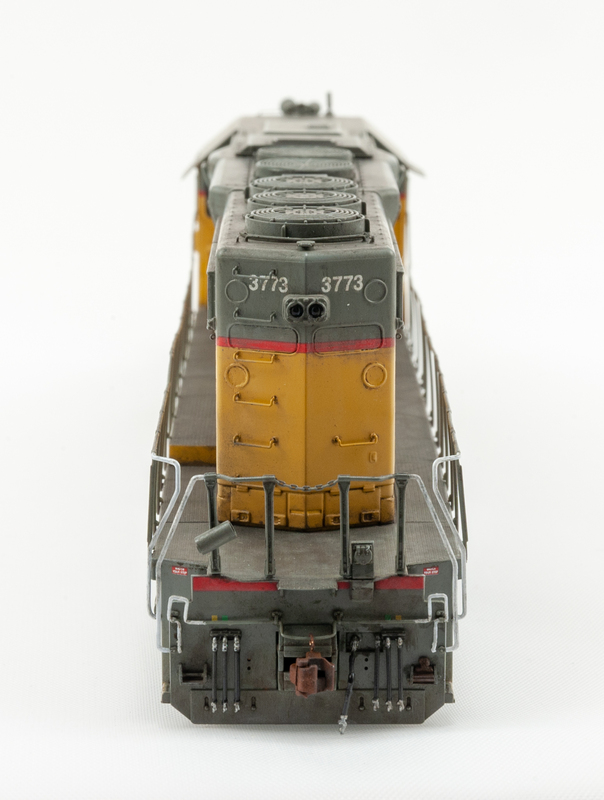 I have a couple SD40-2’s which have been built from Athearn, GSB, and Kato models. 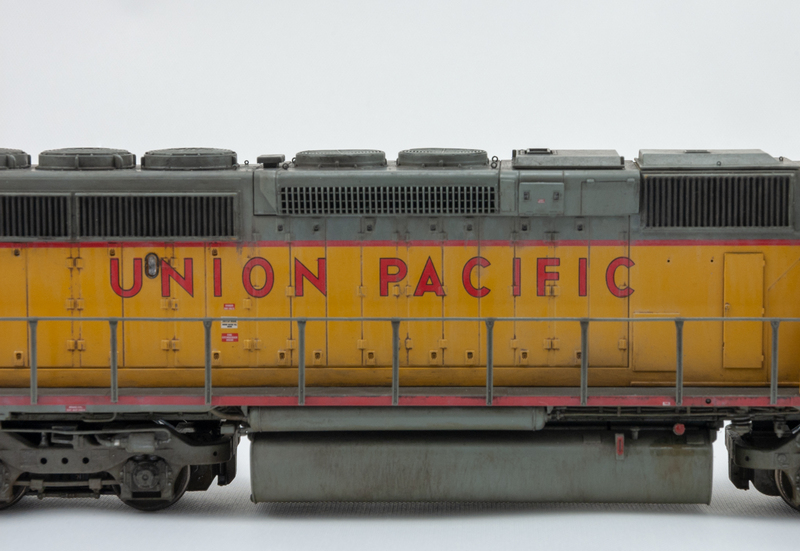 I wish I could justify buying one of the ScaleTrains SD40-2’s, but so far, have not been able to justify a purchase, now if they did a high nose N&W version…. maybe enough to push me over the edge to get one. 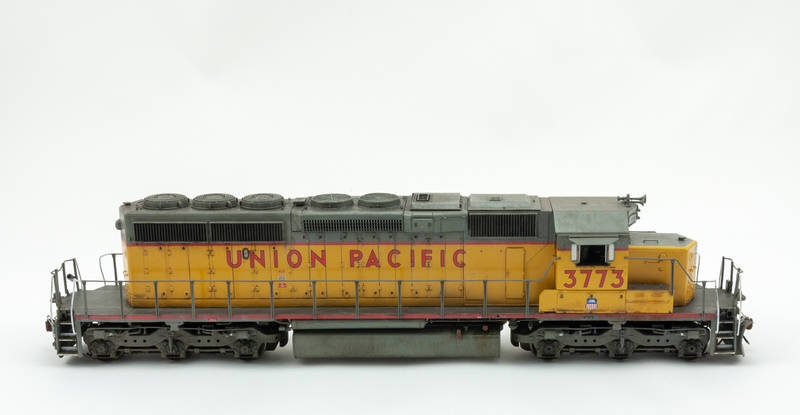 Scale Trains already did a Southern high nose, so I wouldn’t be surprised if they have an N&W in the pipeline.